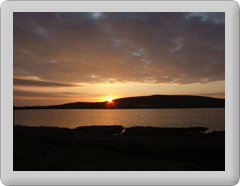 Shetland is well connected to the UK mainland, and Fetlar has reasonable transport links with the rest of Shetland. However, given that you will certainly have to use the scheduled ro-ro ferry service, pre-planning will make your journies more efficient, minimising waiting times at the ferry terminals. You should note that Northlink Ferries (the company which operates the ferry service between Aberdeen and Lerwick) will only carry trucks if they have 'strong points' that can be used for lashings. Please contact Northlink Ferries, and be sure to check with your removal company that their vehicles comply with these conditions if intending to sail North. A free app is available for both Apple and Android devices. This includes details of local internal ferry, bus and air services. Serch on the appropriate store for "Shetland Travel Information"